Banana oatmeal raisin sunflower seed spice cookies recipe is a delicious vegan treat that can be prepared and baked in less than an hour, and will make approximately 24 cookies. The recipe contain no added oil or sugar, and the cookies are totally sweetened by the raisins and bananas. They are great for dessert or a snack, and are wonderful treat to take as a snack when traveling. Place the spelt, or whole wheat flour, and the quick rolled oats (oatmeal) in a bowl and mix together. Add the sunflower seeds, cinnamon, allspice, nutmeg, and cloves and mix well. Add 2 cups of the raisins and mix well to ensure that the raisins are not sticking together, and that they are thoroughly coated with the flour mixture. Place the peeled bananas and the remaining cup of raisins in the container of a high speed blender. Cover and run at high speed until all the ingredients are thoroughly blended and smooth. Sprinkle a baking sheet with a light coating of oatmeal, place the cookie dough in 24 equal sized “mounds.” (We usually start with a well rounded tablespoon full of cookie dough for each cookie, and add any leftover dough to the cookie mounds on the baking sheet.) Smooth and shape each cookie with a spoon or spatula, as desired. Place the baking sheet in the preheated oven and bake at 350 degrees F. for 20-25 minutes. Various ovens bake differently, so we suggest that you begin checking the cookies after 15-20 minutes of baking time. The cookies should be firm, but still soft enough to be a little “springy.” Be careful not to over-bake. 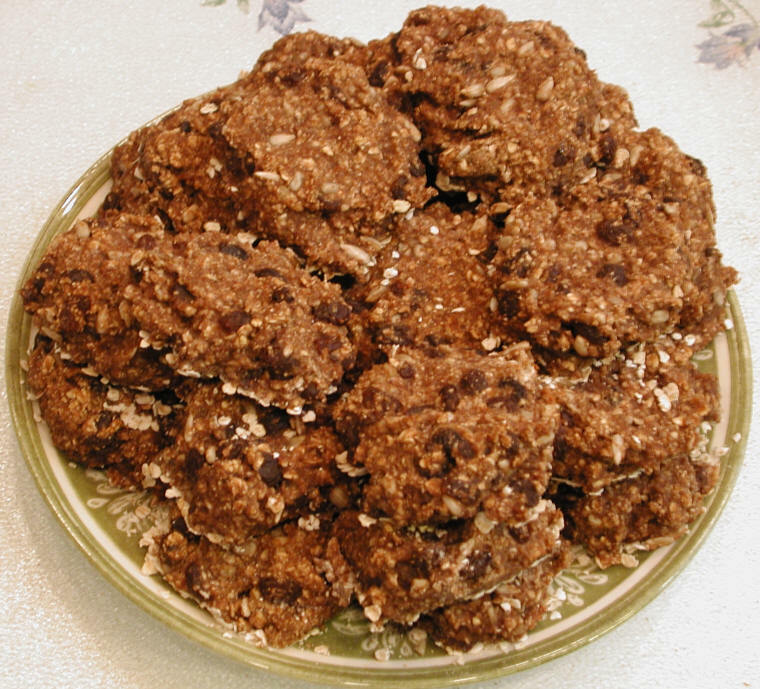 When the banana coconut raisin oatmeal spice cookies are baked, remove from the oven, cool, and enjoy. Store any leftover cookies in the refrigerator in a covered container or storage bag.